Hi Glen, Crayford is worth a visit for many reasons not least its unique structural arrangement but the memorials are impressive. Knowlton even more so as there are more memorials in this tiny church than the Narborough one. RWTA - thanks! I'm hoping to visit the church in Crayford one day when time permits. Would also like to see the monument at Westminster Abbey. I imagine it will be pretty impressive. Wonder if the pic of the shipwreck on this monument is the same as the one at Knowlton and perhaps Gibbons did the Knowlton memorial. A pic and description of the monument at Westminster. Excellent write up and amazing life - I must go to Westminster and see his tomb to complete the set. Cloudesley Shovell was born in Cockthorpe, Norfolk in 1650. His unusual Christian name was the Surname of his maternal grandmother. Through family connections he joined the Navy as a cabin boy in 1664 and his career progressed steadily over the years. Early in his career he went on voyages to the West Indies and South America and on 22nd January 1672 he became Midshipman on the Royal Prince and saw action at the Battle of Sole Bay on 28th May. A combined British and French fleet were surprised and attacked at Sole Bay (near Southwold on the Suffolk coast) by the Dutch lead by Admiral Michiel de Ruyter. Later in 1672 Cloudesley was promoted to Master's Mate aboard the Fairfax, then later the Harwich and finally the Henrietta. On 21st August 1673, he again saw action, this time at the Battle of Texel. A combined Anglo French fleet attempting to land troops in the Netherlands was repelled by a smaller Dutch force, again lead by Admiral de Ruyter. On 25th September 1673 Cloudesley was promoted to the rank of Second Lieutenant aboard the Henrietta and sailed to North Africa. In 1675 he transferred to the Harwich and took part in a year long action against the Barbary pirate stronghold at Tripoli. dal, said to be worth £100, from King Charles II himself. This was the beginning of his rise to prominence. On 16th April 1677 Cloudesley was once again promoted to First Lieutenant aboard the Plymouth and just six months later he received his first command as Captain of the Sapphire, a 32 gun ship. He spent the next nine years in command of various ships in the Mediterranean carrying out operations against the Barbary pirates. 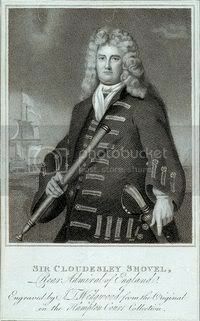 In May 1689 he was in action at the Battle of Bantry Bay (in Ireland) as Captain of the Edgar. A French fleet was landing troops and supplies in support of the Catholic James II who was fighting the protestant forces of King William III (of Orange) who had taken the crown of England in 1689 following the Glorious Revolution. The Edgar was in the thick of the action and after the battle Cloudesley was knighted by the King. In 1690 Sir Cloudesley was promoted to Rear Admiral of the Blue and in 1691 he married Lady Elizabeth Narborough, the widow of his former commanding officer. In 1692 he was promoted to Rear Admiral of the Red and took part in the Battle of Cape Barfleur in May. An Anglo Dutch fleet successfully attacked the French. During this action, Sir Cloudesley was injured in the thigh and suffered from blood poisoning but was fortunately able to recuperate back in England. In 1693/4 Sir Cloudesley was involved in further actions against the French in the English Channel. In 1694 he set up residence with his wife at May Place, Crayford, Kent and in 1695 was elected MP for the town of Rochester. He remained as MP until his death in 1707. In 1696 he was promoted to Admiral of the Blue and in 1702 Admiral of the White by Queen Anne who had succeeded King William III. Sir Cloudesley was to become a particular favourite of the Queen. Following his part in the capture of Gibraltar in 1704, he was appointed Rear Admiral of England. On the 13th January 1705 he became Admiral of the Fleet and on the 1st May the same year he was given joint command (with the Earl of Peterborough) of an expeditionary force to the Mediterranean. During this command he successfully laid siege to the Spanish port of Barcelona. In November 1706, Sir Cloudesley's career reached it's peak when he was appointed sole Commander-in-Chief whilst at Lisbon. In April 1707, he was back in action at Toulon in Southern France and succeeded in scuttling the French fleet, and almost capturing the city itself. During the homeward voyage, the weather had been very bad with poor visibilty. On the 21st of October the Admiral made an (astronomical) observation, probably the first he had been able to take for many days. On the following day, he brought to and layby at about 12 o'clock and summoned all the sailing-masters of the various ships on board his ship the Association. There followed a consultation regarding the fleet's actual position. All were of the opinion that they were in the latitude of Ushant near the coast of France, except the master of the Lenox, who judged they were nearer the Isles of Scilly. Sir Cloudesley unfortunately followed the view of the majority which not long after proved to be a fateful decision. The Admiral gave the signal for the fleet to sail at about six o'clock that evening. The Association, lead the van, closely followed by the St. George, Eagle, Romney and the other ships, steering toward the north east in the full (misguided) belief that they had the English Channel open before them. During the night, the wind had increased to a gale with squalls and rain and at around eight o'clock the Association (96 guns), together with the Romney (50 guns) and the Eagle (70 guns), were all swept onto the Bishop and Clerk rocks off the Isles of Scilly and foundered. Another ship, the St George, had a lucky escape. She hit the same reef as the Association but was miraculously lifted off by a large wave and deposited into deeper water. The Firebrand had also gone onto the rocks and foundered, but her Captain and seventeen men managed to get ashore by boat. Another five of her crew got ashore on pieces of wreckage. Of the 1315 men aboard the Association, Romney and Eagle, there was only one survivor, the Quartermaster of the Romney (described as "a North country-man, a butcher by trade, a lusty fat man but much batter'd with ye rocks"). Sir Cloudesley Shovell, his two step sons (the sons of his wife's late husband Admiral Narborough) and Captain Edmund Loades (his wife's nephew) were among those that perished. The body of Sir Cloudesley Shovell was washed ashore at Porth Hellick Cove on St Mary's in the Scillies. At that time, The Scillies had a wild and lawless reputation and it is believed that poor Sir Cloudesley was still alive when he came ashore semi-conscious, but was murdered by a local woman who had noticed his rings. They included a large emerald and diamond encrusted ring that had been give to him by a close friend, James Lord Dursley (who later became the Earl of Berkeley). According to a letter written in 1709 by Edmund Herbert (a young man sent to the Scillies by the family to help locate "property" belonging to the Admiral), Sir Cloudesley's body was first found by two women "stript of his shirt" and " his ring was also lost off his hand, which however left ye impression on his finger". Sir Cloudesley's poor grief stricken wife Elizabeth, who had not only lost her husband and nephew but also her two sons in the tragedy, had offered a large reward for the recovery of any family property. the first joint of one of his forefingers being broken inwards. He had likewise a shot in his right arm, another in his left thigh". Sir Cloudesley was initially buried in the sand at Porth Hellick Cove but his body was later brought back to Plymouth aboard the Salisbury, where it was embalmed. It was later carried in state to London. During the journey from the West Country large crowds turned out to pay their respects to the Admiral. 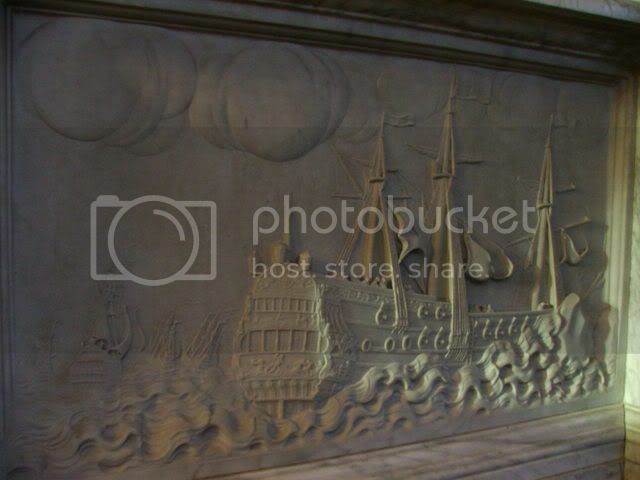 On 22nd December 1707 he was given a state funeral befitting of an English naval hero at Westminster Abbey. "Sr CLOUDESLY SHOVELL Knt Rear Admirall of Great Britain and Admirall and Commander in Chief of the Fleet: the just rewards of his long and faithfull services. He was deservedly beloved of his Country and esteem'd, tho' dreaded, by the enemy who had often experienced his conduct and courage. Being shipwreckt on the rocks of Scylly in his voyage from Thoulon the 22d of October 1707, at night, in the 57th year of his age his fate was lamented by all but especially the sea faring part of the Nation to whom he was a generous patron and a worthy example. His body was flung on the shoar and buried with others in the sands; but being soon taken up was plac'd under this monument which his Royall Mistress has caus'd to be erected to commemorate his steady loyalty and extraordinary vertues". The missing emerald ring was rumoured to have been recovered some thirty years later, when the woman who is assumed to have murdered Sir Cloudesley made a death bed confession to her clergyman who returned it to James Lord Dursley (the Earl of Berkeley). Following the wreck of the Association and the other ships, the Admiralty instigated the search for a way of accurately calculating longitude. This problem was eventually solved some years later by John Harrison who invented the marine chronometer. Wonder what the connections are there? The admiral and Commander in Chief of Queen Annes Navy was aboard his ship with his two young stepsons from his wife Elizabeth's previous marriage to Sir John Narborough of Knowlton on 22 October 1707. They were all aboard the flagship Association when it is said Shovel ignored warnings about the weather and steered the whole fleet towards the rocks on the Scilly Iles. The Association foundered and sunk inside 4 minutes. All 800 crew died that day. It is also said that when he was washed up ashore he was actually alive and was murdered by a local woman in order to steal the ring off his finger. 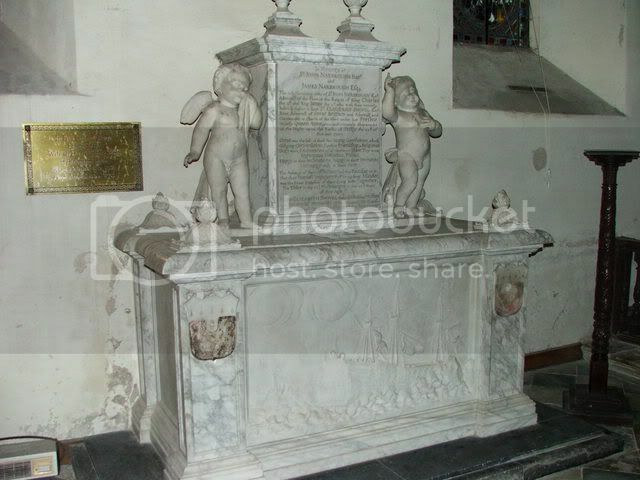 Elizabeth Shovel is buried in St Paulinius Church Crayford where there is a memorial to her and her husband. 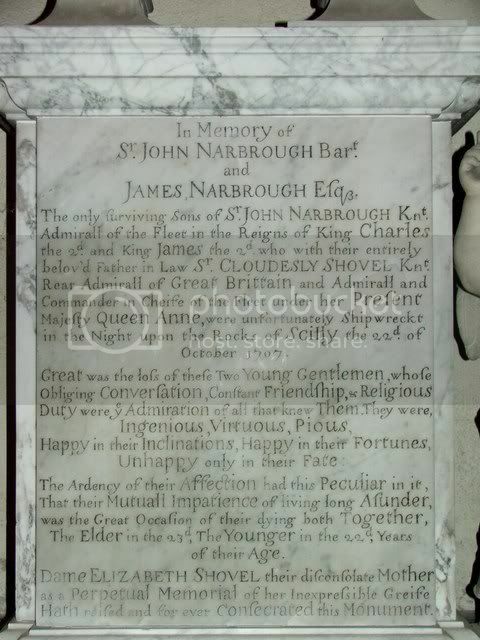 He is also mentioned on the sad memorial to his stepsons Sir John Narborough (jnr) aged 23 and James Narborough aged 22 in Knowlton Church. The memorial displays an incredible rendition of the grounding of the Association. 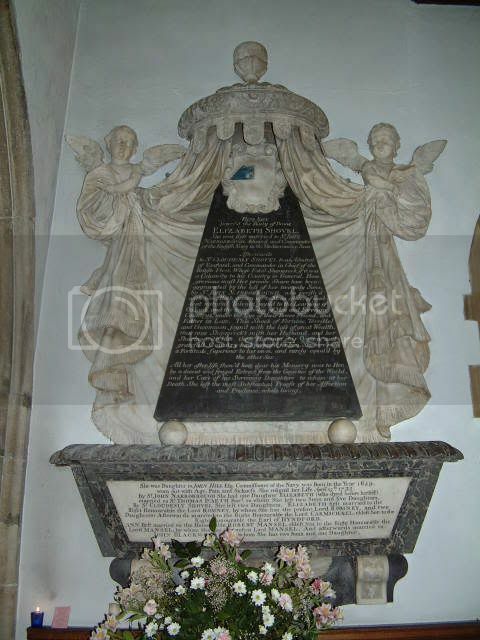 Shovel himself was buried on the Isles of Scilly initially and later re-interred in Westminster Abbey.